Imagine your boss suddenly told you that from now on you were going to be considered an independent contractor. You’d have to pay for your office space, supplies, and equipment. Your employer would deduct those expenses from your paycheck. And you’d have to pay all your payroll taxes, including your employer’s share. You’d also be responsible for doing whatever work your boss gave you, no matter how long it took, with no extra pay. That’s the situation most of the nation’s port truck drivers are in. You may not know what a “port truck driver” is, but virtually everything in your home or office that is imported was carted around at some point by one of them. On average, these drivers work 59 hours a week. The companies that hire two-thirds of port drivers deduct the cost of buying and maintaining their trucks from their paychecks. The drivers have to pay for fuel and take care of all the payroll taxes. 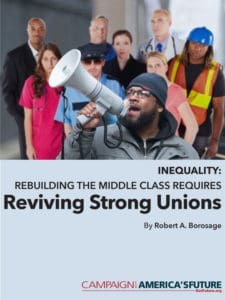 They get no benefits, no workers’ compensation coverage or unemployment insurance, and they earn much less money than their officially employed counterparts, according to a report from the National Employment Law Project, the Los Angeles Alliance for a New Economy, and the Change to Win Strategic Organizing Center. Instead, the drivers get a fixed amount of money, no matter how long it takes to pick up goods at the port and deliver them to warehouse distribution centers. Even though the drivers are only allowed to work for one company, that one company illegally treats them as independent contractors instead of employees. It’s a sweet deal for the companies, which hire 49,000 drivers around the country. But it’s a lousy deal for the drivers, U.S. taxpayers, and the more responsible businesses — which hire more than half that number (26,000) as actual employees. The practice has been going on so long that most of the drivers don’t know it’s illegal. But as they learn that their bosses are abusing the law to rip them off, port drivers are pushing back. In early July, 120 port drivers in Southern California went on a five-day strike. The strike, backed by the Teamsters union, is part of a new national effort to force employers to comply with the law. Drivers have filed more than 400 claims against companies under California’s wage and hour laws. The first 19 rulings resulted in an average award of $66,240, largely for wage and hour violations and illegal paycheck deductions for items like truck leases. The drivers are also filing complaints with the National Labor Relations Board (NLRB), which governs union organizing. The labor law doesn’t cover independent contractors. After Green Fleet — one of the picketed companies — fired two workers for union organizing, the NLRB ruled that the workers are legally employees and that firing them broke the law. Of course, Green Fleet is appealing the ruling. As organizer Danny Feingold points out, unlike some other retailers, such as Nike, Skechers has refused to sign a code of conduct with labor standards for its contractors. Earlier this year, New York state enacted a law that lays out specific criteria for what constitutes an independent contractor in trucking and provides for both fines and criminal penalties for violating the law. New Jersey Governor Chris Christie vetoed a similar bill in his state. The best solution would be a federal legislative fix that puts real teeth into the existing laws against misclassifying employees as independent contractors. We all must remember that this trucker fight is also our fight. As employers around the country drive down wages, cut benefits, and avoid taxes all to reap higher profits, they’re demolishing the middle-class economy. We need economy-boosting jobs, not economy-busting jobs, to support and care for our families and move forward to a more equitable future. Richard Kirsch is a senior fellow at the Roosevelt Institute and the author of “Fighting for Our Health: The Epic Battle to Make Health Care a Right in the United States.” He’s also a senior adviser to USAction. Distributed via OtherWords.